We saw this funny (fake, we hope) photo recently and tweeted about it. It cracked us up! 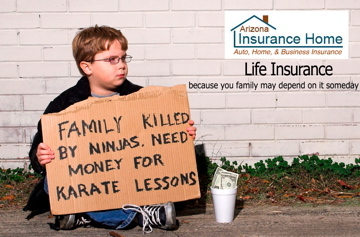 You’d think it would be hard to find anything funny about life insurance, but it turns out that you can. It’s like the old quote from the film Crimes and Misdemeanors (1989), “tragedy plus time equals comedy.” Whenever you talk about insurance that pays off only when someone dies, well, there’s a tragedy in that, so comedy just needs a little time to make it stick. We were wondering if there’s any humor at all with homeowner insurance. It turns out that there’s plenty. Indeed there’s a whole section on the humor site Funny or Die, devoted to homeowner stuff. There’s a bunch of great videos and more, not all of it appropriate for all audiences, but it’s worth taking a look at. We looked around, however, and found that most of the homeowner stories out there aren’t funny at all. People don’t turn to the internet to post stories about how they had a problem and it resolved just fine. No, they go to the internet to complain. The best way to avoid these kinds of not-funny stories is to make sure you have insurance that will really take care of you when something goes wrong. Sure, you could get some cheap insurance or inadequate insurance, but then when something goes wrong, all you’ll be able to do is go complain about it on the internet, and that won’t be funny (or fun) at all.